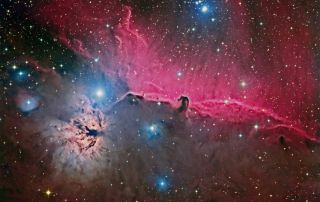 Terry Hancock took this image of the Horsehead Nebula from DownUnder Observatory in Fremont, Mich. He used a combination of data from three different telescopes and focal lengths acquired with the QHY9M Mono CCD/TMB92SS in RGB and H-Alpha, RGB data from a Canon 5D II/TMB130SS and H-Alpha data of just the Horsehead Nebula using the QHY9M/Astro-Tech 12" RC. The image was released April 26, 2013. A veteran astrophotographer combined data from three different telescopes to capture this vivid image of the famous Horsehead Nebula. Stargazer Terry Hancock took this stunning shot from Down Under Observatory in Fremont, Mich. He used a combination of data from three different telescopes and focal lengths acquired with the QHY9M Mono CCD/TMB92SS in RGB and H-Alpha, RGB data from a Canon 5D II/TMB130SS and H-Alpha data of just the Horsehead Nebula using the QHY9M/Astro-Tech 12" RC. The image was released April 26, 2013. "The recent combining of data from the 12" RC allowed me to get much finer detail from the Horsehead," Hancock told SPACE.com in an email. The Horsehead Nebula is easily recognized for its unique shape similar to that of a horse's head. Located in the constellation Orion, the nebula is part of a large, dark molecular cloud. Also called Barnard 33 in emission nebula IC 434, the nebula is located about 1,500 light-years from Earth. Bright spots in this image are young stars and the strong red glow behind the nebula is caused by hydrogen gas from the nearby star Sigma Orionis.